I don’t know why exactly, but good things come in pairs: rice and beans, The Godfather and The Godfather Part II, my four-year old twins, Kirk and Spock, etc. 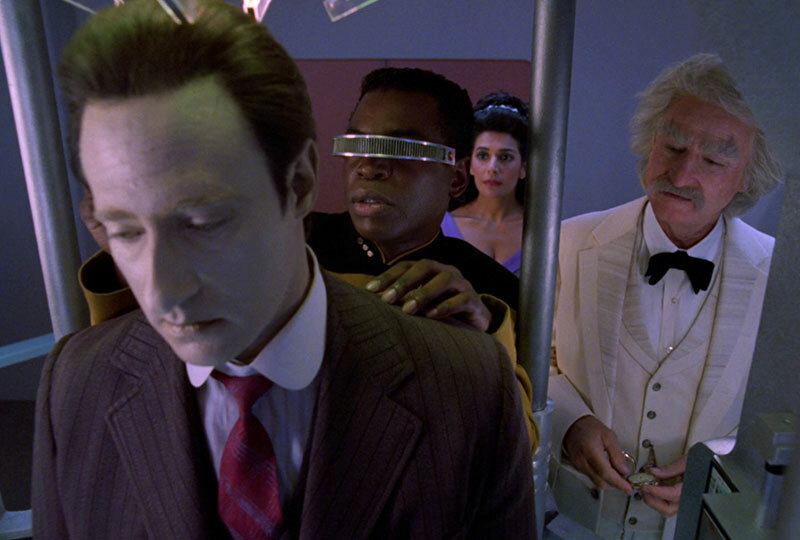 Ever since Star Trek arrived on Netflix UK, I’ve found myself binging on the various TNG two-parters: “The Best of Both Worlds,” “Unification,” “Chain of Command,” “All Good Things” – I’ve watched every single one of them over the last few weeks. Almost without exception, each of these episodes are not just fantastic television but among my very favorite episodes of Star Trek. This got me thinking, why are all the TNG two-parters so good? Before I try to answer the question, it’s probably worth reminding everyone that across seven seasons, TNG had ten two-part episodes: “Encounter at Farpoint,” “The Best of Both Worlds,” “Redemption,” “Unification,” “Time’s Arrow,” “Chain of Command,” “Birthright,” “Descent,” “Gambit,” and “All Good Things.” Now before anyone gets their space knickers in a bunch, I know that both “Encounter at Farpoint” and “All Good Things” were originally presented as two-hour TV movies, later recut as two separate episodes. I’m also aware that there’s been a trend in recent years to release some two-parters as single episodes on Blu-Ray. Let’s just agree that when I say two-parter, I’m referring to the aforementioned ten episodes whose stories were told over 90 minutes, as opposed to the usual 45. So, why are the TNG two-part episodes so good? For starters, I have to believe that there was a lot more external and self-imposed pressure on the writing staff and the crew (both in front and behind the camera) to deliver when it came to two-part episodes. Most of the TNG two-parters either started or ended a season (or indeed started or ended the series). Meaning that it was in the best interest of the studio, and the writers/creative team, to tell stories with high stakes, great action, and meaningful character development. 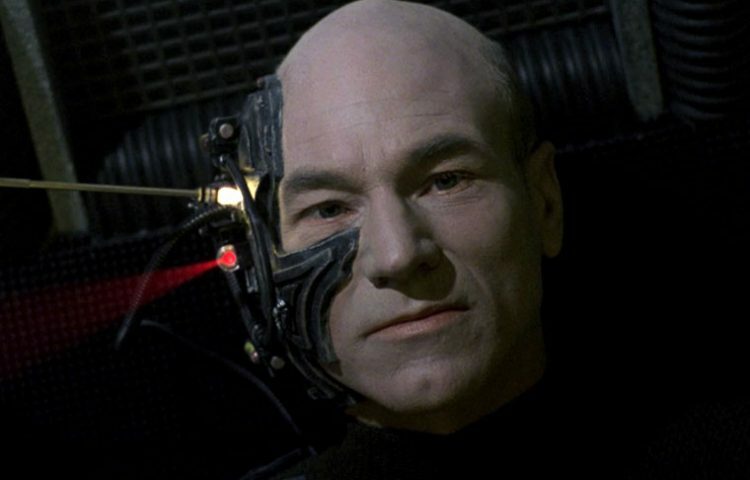 Think of how Picard was absolutely defined by his experiences in “The Best of Both Worlds” or that “Redemption” deepened Worf’s narrative so much, that it took the rest of the TNG run and all of his DS9 tenure to resolve. There was a clear economic and, dare I say, self-preservative reason to ensure these episodes were always crowning achievements. The studio, and the producers, would have wanted the audience to feel so invested and engaged in a particular story that they would wait a week, and sometimes up to four months, for the conclusion. Even the two-parters that weren’t season openers or finales had higher stakes than regular 45-minute episodes. 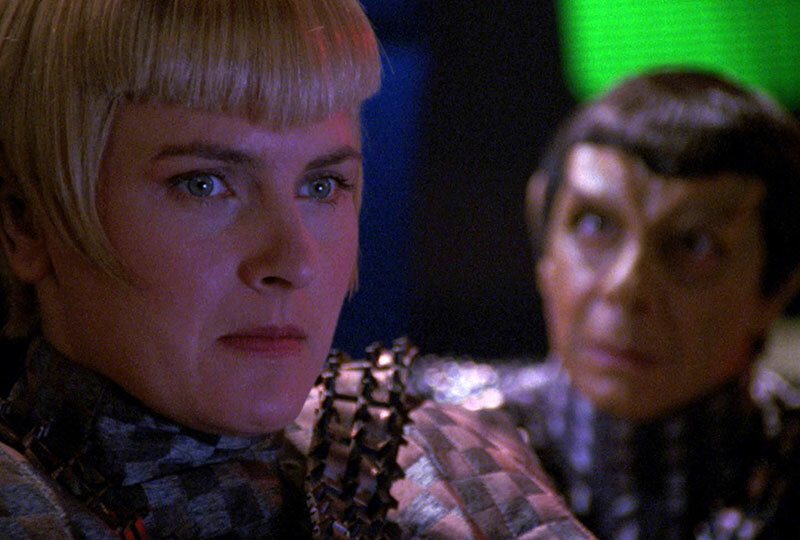 “Unification,” guest starred Leonard Nimoy, brought back Denise Crosby, and was used as a way to advertise “Star Trek VI: The Undiscovered Country.” Patrick Stewart has repeatedly noted that “Chain of Command” was a favorite episode of his. Yes, “Chain of Command” has a great story but what makes the episode truly memorable is how invested Stewart is and the electrifying sparring between him and guest-star David Warner (an old colleague of Stewart’s and two-time Trek movie supporting player). Even “Birthright,” arguably the weakest of all the TNG two-parters, had the Enterprise dock at Deep Space Nine (a ‘welcome to the family’ gesture from one show to another), furthered the now epic Worf arc, and guest starred Alexander Siddig as Dr. Bashir. Each one of these ten episodes was substantial and defining for the crew of the Enterprise-D.
Due to the longer running time, the two-parters were allowed to unfold at a much slower pace; you’re halfway through “Unification” Part 1 before Picard and Data go on their search for Spock. Think of how touching the scene between Picard and Sarek is in that same episode. Because the plots simmer and stories unfold more carefully, there are far more nuanced moments and interactions between the characters. 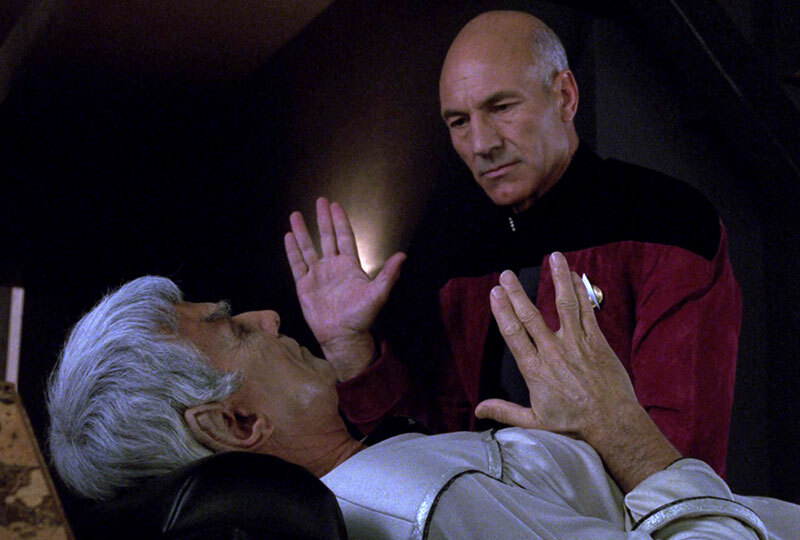 In the case of the Picard/Sarek scene, what occurs between the two of them has deep gravitas and impact not just on Picard but on Spock and on Spock’s relationship with his father (a strained dynamic that dates all the way back to very beginning of TOS). Also look at how well we got to know David Warner’s Gul Madred in “Chain of Command.” Madred was a complex foil to Picard: a caring family man with an obsessive and savage nature. Over two hours, we came to know Madred better than any TNG villain of the week. Madred’s layered depiction is also typical of TNG’s two-parters and what makes those episodes so good. Every two-parter has amazing supporting characters (most of which, sadly, were never seen again on screen). Think of how much we loved, or loved to hate, characters like Commander Shelby in “The Best of Both Worlds,” Captain Jellico in “Chain of Command,” or Gowron and the Duras sisters in “Redemption.” We felt so passionate about these guest stars because we understood their motivations and ambitions (and also because of how good those actors were). The ability to tell a story over two episodes must have been both a relief and a challenge to the TNG writing team. I’m extremely happy that they always managed to pull it off. All of the TNG two-parters are truly great TV. So much so, that here we are, almost 30 years later (! ), still talking about and enjoying them even after what is probably an embarrassingly number of viewings. (I think I’ve watched “The Best of Both Worlds” more times that I’ve listened to “Purple Rain” – in other words: a lot). 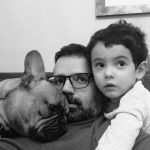 When not drinking coffee or watching Star Trek (or other sci-fi), Carlos spends his time running around London working on several projects. He has incredibly rambunctious boy-girl twins (his wife foolishly did not let him name them Luke and Leia). You can follow Carlos on Twitter @doublemacc.